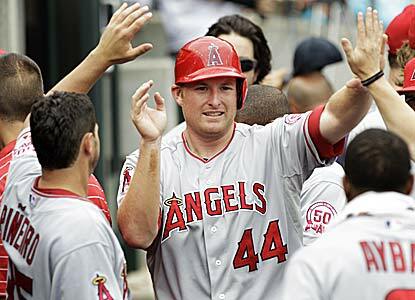 Mark Trumbo (2006-07) hit his fifth HR of the season in the Angels 7-3 loss to the Red Sox. Erick Aybar (2003) went 1-4 with a double and a RBI, Jeff Mathis (2002) was 1-4, Peter Bourjos (2007) went 1-4 and Howard Kendrick (2004) was 0-4 in the game. Alexi Casilla (2004-05) went 1-4 in the Twins 1-0 victory over the White Sox. Sean Rodriguez (2004-05) was 1-3, stole a base and scored a run in the Rays 3-2 win over the Blue Jays. Casey Kotchman (2002) entered the game as a defensive replacement. Mike Napoli (2001-02) went 0-4 in the Rangers 4-3 loss to the Mariners. Brandon Wood (2004) walked in his only plate appearance in the Pirates 6-5 loss to the Padres. Joe Saunders (2002) struck out two in six innings of work while allowing three runs to take a no-decision in the Diamondbacks 4-3 win over the Rockies. Howard Kendrick (2004) went 2-5 and scored a run in the Angels 9-5 loss to the Red Sox. Jeff Mathis (2002) was 1-3 with a walk and scored a run in the loss. Peter Bourjos (2007) went 1-4 with a stolen base, Erick Aybar (2003) was 1-4 and scored a run and Alberto Callaspo (2003) went 0-4 in the game. Mike Napoli (2001-02) went 0-1 as a pinch hitter in the Rangers 5-4 loss to the Athletics.